Félix Ventura is an albino, who has the ability to sell you a past of your choice. Once upon a time, he had a visit of a male stranger who refused to reveal his real identity but requested to buy a past for himself. In the meanwhile, Félix fell in love with a lady who seem to have something in common with the stranger but also was unwilling to reveal her true identity. As the story unfolds, a wall gecko who is the omniscient narrator of the novel revealed the intriguing mystery connecting these people. This novel set in Angola is different from anything you have ever read before. You might have the feeling that it could be a surrealistic read; actually, there is nothing short of realism in it. Of course, apart from the talking wall gecko, which gave it a touch of originality. 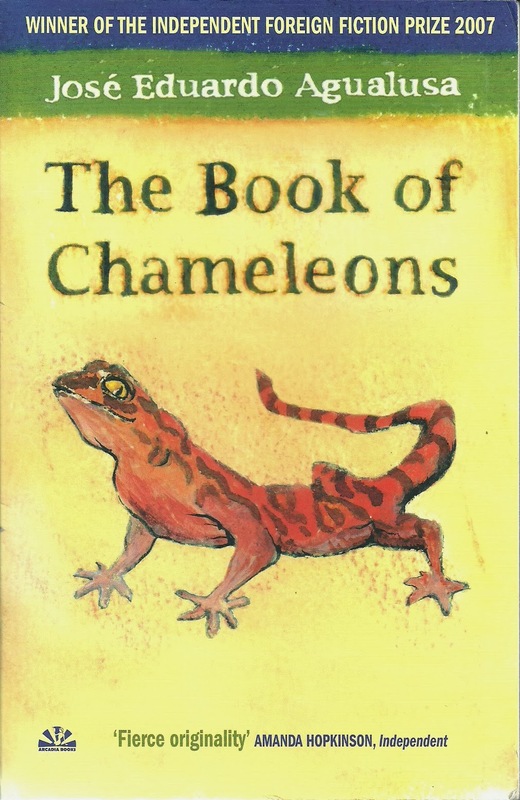 In addition, "The Book of Chameleons" kind of philosophies on our identities, existence and what we seem to believe about ourselves. That is, there is no absolute truth with respect to our true identity. "The truth has a habit of being ambiguous too. If it were exact it wouldn't be human". Nothing seems true that cannot also seem false. There are dozens of professions for which knowing how to lie is a virtue. I'm thinking of diplomats, statesmen, lawyers, actors, writers, chess players." "The truth is improbable. Lies are everywhere. Even nature herself lies. What is camouflage, for instance, but a lie? The chameleon disguises itself as a leaf in order to deceive a poor butterfly. He lies to it, saying Don't worry, my dear, can't you see I'm just a very green leaf waving in the breeze, and then he jets out his tongue at six hundred and twenty-five centimetres a second, and eats it"
Finally, it was an interesting short read that surprisingly swept me off my feet. I will recommend if you are looking for something fresh from the African continent. It is different, artistic and an easy read. It is also the winner of the Independent Foreign Fiction Prize 2007. I would like to read more from José Eduardo Agualusa. I read this some time ago, at the early stages of my blogging when my insight of books was not that acute. The blurb destroyed the book for me. I shouldn't have read it. It said it was a story of murder, so I thought it was whodunit and with that in mind, I failed to grasp it. But I will visit it, probably next year. Your review has opened a new window of understanding for me. Nana, I try not to read book blurbs. What I actually do read is readers review of the novel. The rating as well... though they could as well be misleading but I'd rather read that than blurbs. I am glad I have given you a new insight. I look forward to reading your opinion. Sounds different. I like that it swept you off your feet. LOL... Thanks. it actually is different. Hablo y entiendo español, he visto tu blog y me encanta. Lo comprendo todo. Mira, me econtraste tú primero. Qué curioso, el título en español "vendedor de pasados" pega más.